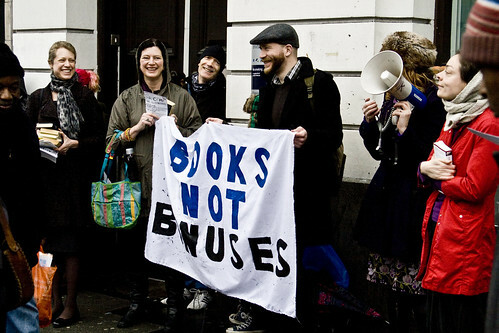 Two events have been called at Minet Library at Myatt’s Park, this Saturday, National Libraries Day, in response to controversial plans by the council to shut Libraries. 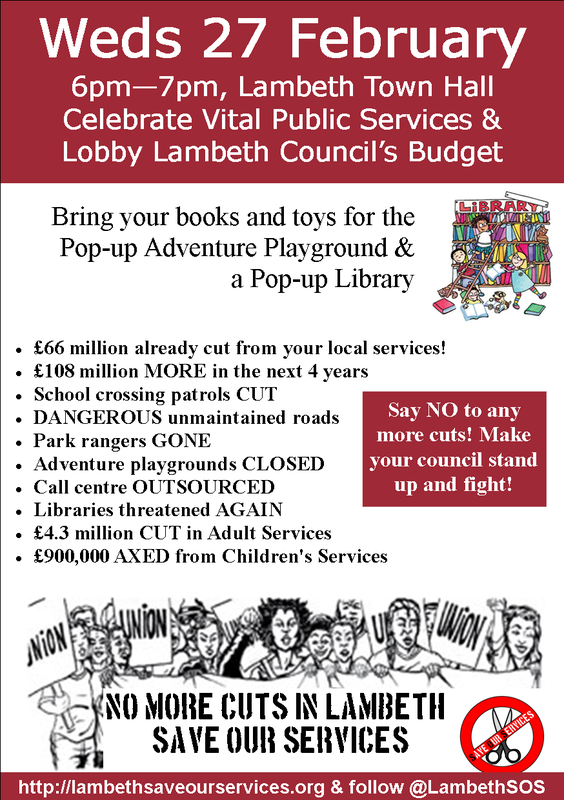 Lambeth Council is planning to sell the Minet and Waterloo Libraries. Funding will also be stopped for Durning, Carnegie and Upper Norwood Library. If community groups do not come forward to take over Durning, Carnegie and Upper Norwood Library, they too may face closure. UNISON say they will work with the community to fight the Council’s proposals. The Save Lambeth Libraries campaign have called an event called “Save Our Library Because…” at Minet Library, at 3pm on Saturday 7 February, World Libraries Day. 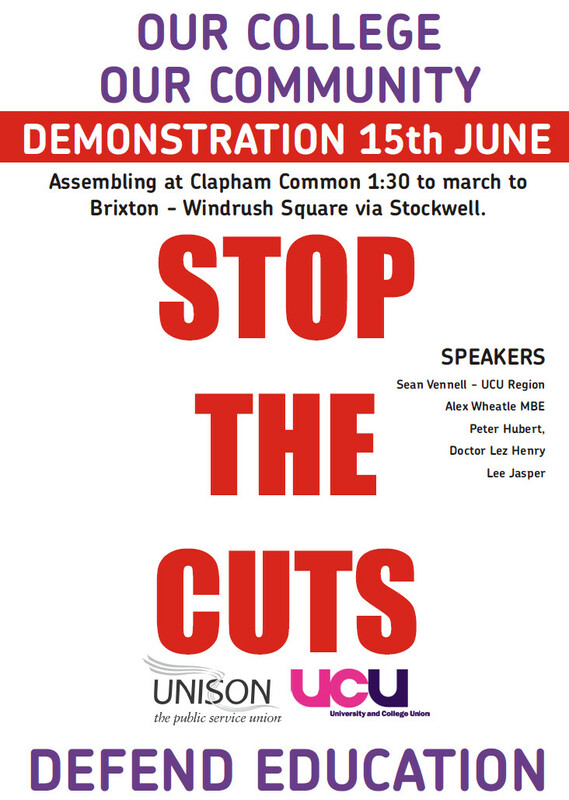 This is followed by a candle lit vigil in Myatt’s Field Park to protest both Library cuts and 50% cuts to the Park, called by the Myatt’s Field Hub. Posted: May 25, 2013 by rabidleftwinger in Demonstrate, Rally & Occupy! Posted: April 9, 2013 by rabidleftwinger in Demonstrate, Rally & Occupy! Wednesday 27th Feb leaflet, pass it out and put it up everywhere! Posted: February 22, 2013 by blackdaffodil in Cutswatch, Demonstrate, Rally & Occupy! 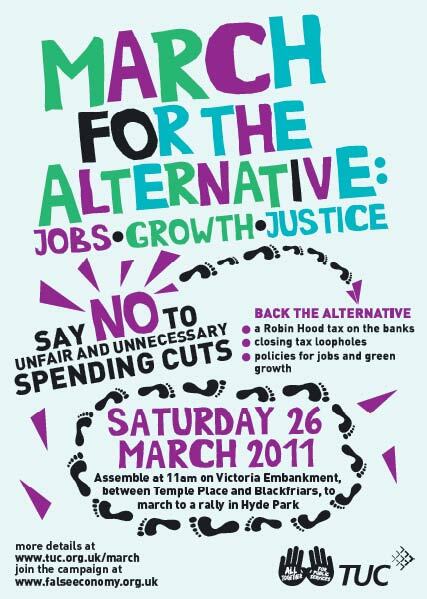 Posted: March 12, 2011 by blackdaffodil in Demonstrate, Rally & Occupy! We’ll be assembling in Kennington Park at 10.30am so bring a pack lunch and all the banners, instruments and home made placards you can carry. 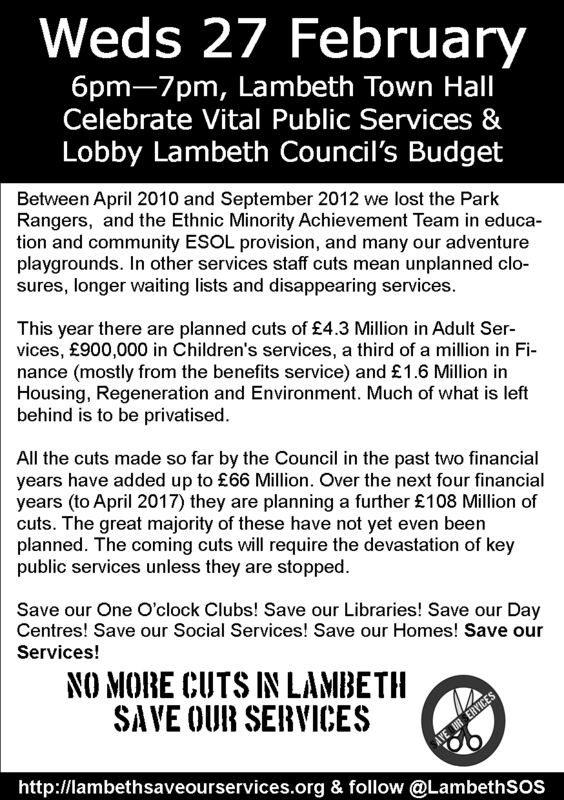 The feeder march has been called by Lambeth SOS, Southwark SOS & Lewisham Anti-Cuts Alliance﻿. 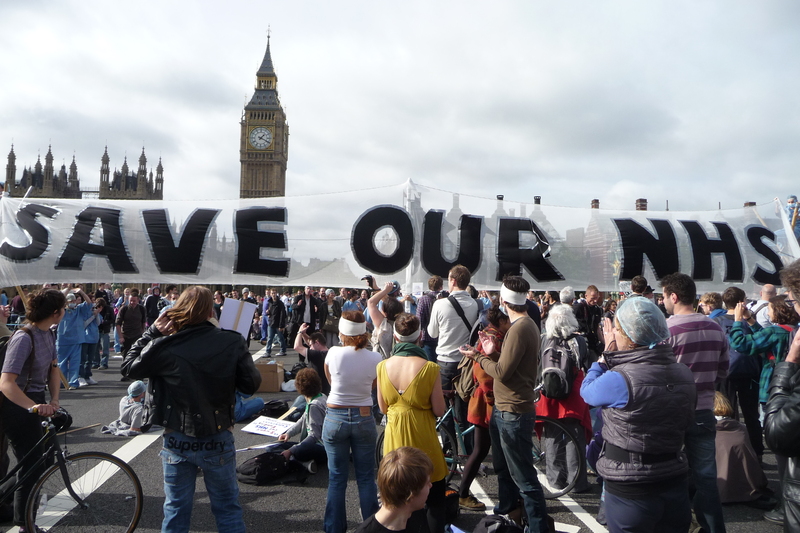 GPs, Unions and patient groups are uniting to keep the NHS public and to keep the market and the private profiteers out. Students and staff have taken to the streets in their tens of thousands to stop funding cuts in education at all levels. In Lambeth, parents and play workers are uniting against the closure of adventure playgrounds and youth clubs. Thousands have signed the petition to stop all the park rangers being sacked. Workers in the libraries and in Lambeth Living are balloting for strike action in response to Council plans to close 4 libraries, 2 mobile libraries and to cut frontline services on housing estates. 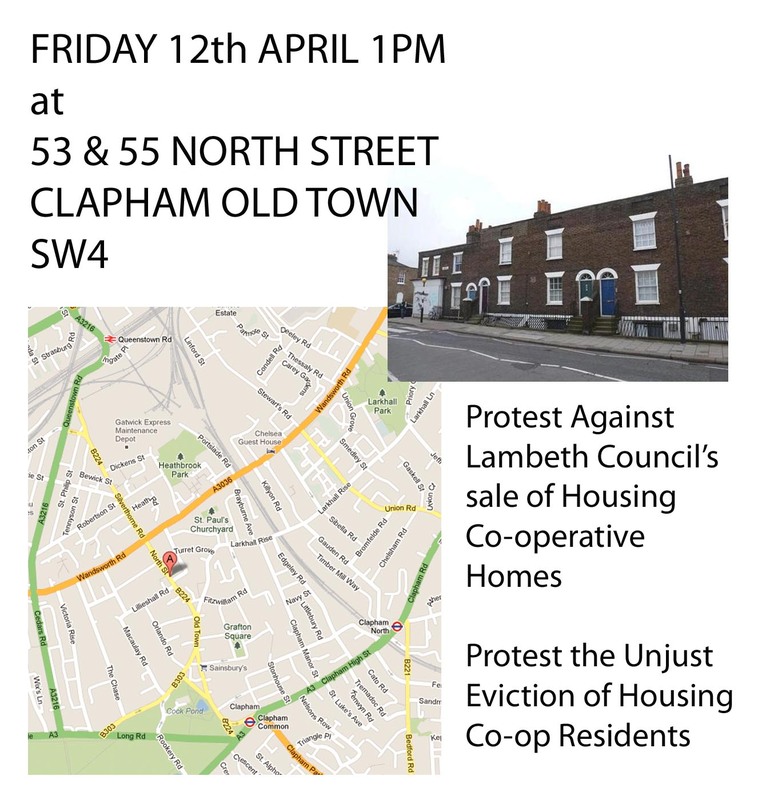 Lambeth SOS is an umbrella organisation of local trade unionists, community organisations, pensioners and students working to support & build every struggle against cuts, to save services, to stop job losses and to bring down the ConDems! 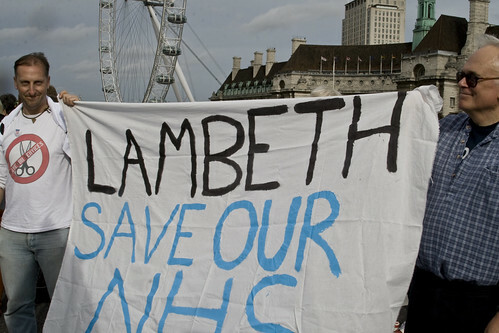 Join the national demonstration on March 26th and get in touch at http://www.lambethsaveourservices.org. Our next open meetings are on Thursday 17th and 31st March at 6.30pm in the Vida Walsh Centre, Saltoun Road, Brixton. Posted: February 28, 2011 by blackdaffodil in Demonstrate, Rally & Occupy! Just got back from Camden town hall, I went with the LSE contingent because it’s our University’s borough, but showing a little solidarity from Lambeth SOS as well! I have no nice words for our Labour council at all, but Camden’s Labour council had upwards of 30 policemen waiting for their constituency. They closed down the main entrance, and police lined the concrete ramp leading to the small door labeled staff entrance. They are planning to close the centre. They were voting tonight. We chanted with the small crowd, I can’t tell you how awful it was to stand next to elders in wheelchairs across the road from the hall while the police stared at us. 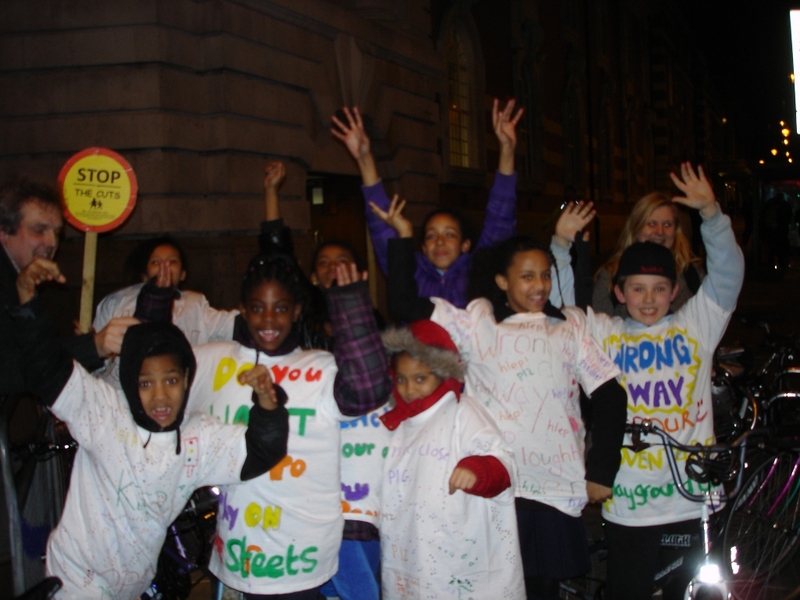 But that’s when the main contingent showed up from Camden United Against the Cuts. They had a bus! And several hundred people and we took over the road and got rid of the barriers. There were attempts to break through the police line, chants of ‘Whose town hall? Our town hall.’ But there were too many of them and the doorway far too defensible. So we took Euston Road, and held it. At no point before then did I see them allow anyone from the public into the building, and I heard that not even all of the official delegations got in. At least not until we had held the road for forty minutes or more. Maybe more, it felt like more, it was ridiculously cold and damp and my feet and hands have still not recovered. Word was that the meeting had been adjourned, postponed, dragged out, who knows. But they finally did let a handful of people in, a ploy to get us off Euston Road? Text from inside said that the balconies were empty. And then they stopped letting people in. I laughed at, and others argued with, the police. Not much else to do given their numbers and their funny array of hats. And then I was just too cold, and so I came home, though I was feeling as though I could leap a double line of policemen in a single bound if only to be warm again. But I figured that might be slightly delusional. When I left we were still holding the road. For some amazing pictures and another take, check out this great blog from HarpyMax, and then there are some more great pictures from demotix, especially if you like pictures of policemen. There’s a great longer post, which includes info on the UCL and anticuts occupations, with a picture from inside Camden town Hall at beyond clicktivism, And make sure you check out the Camden United Against the Cuts site for what’s coming next! No ifs, no buts, no public sector cuts. I’m looking forward to fighting with you all until we win. Or I get so cold I can no longer move my fingers. UK Uncut came out in force against the cuts in Brixton this morning, cold and rainy as it was, as part of the Big Society Bail-In. The demand? Books Not Bonuses. How can it possibly be such an uphill battle to save thousands of jobs, frontline services, and a tradition of taking care of each other, when making Barclays (and all the rest) pay their tax could pay for it all? So we’ll see you on Wednesday, February 23rd, 6pm at Brixton Town Hall to protest as Lambeth Council votes on a budget that will cut almost every council service, anything up to 1000 council workers, and 25% of all staff.